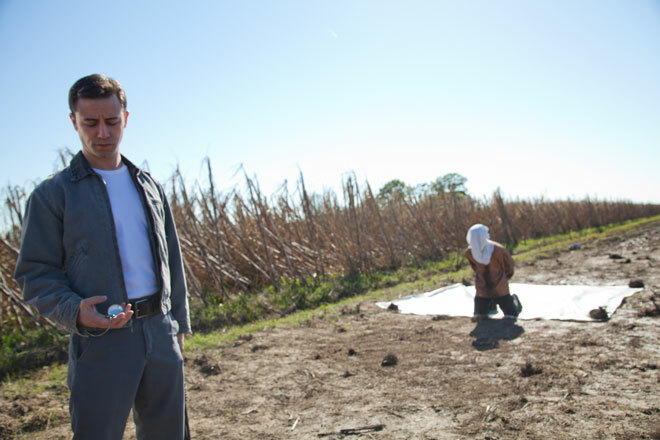 Even though it’s a sci-fi movie about time travel and other, older selves, a lot of Looper takes place on farm land. This may be because the budget didn’t allow for a vast futuristic city to be created, or because writer/director Rian Johnson wanted to escape that mold. Either way, it works. 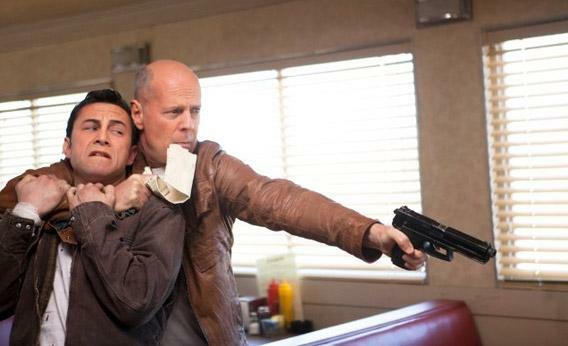 Looper may have a few logical lapses and plot holes, but it succeeds in creating a futuristic hell ruled by thugs. Though there is the traditional protagonist narration explaining how things work at the beginning, for the most part Johnson just lets his story play out and doesn’t over-explain things. The breakneck pace with which Looper unfolds in the beginning makes it easy to get absorbed into its world. Joe (Joseph Gordon-Levitt) is a hitman for the mob of the future, called a Looper. He lays out a tarp in the middle of a corn field at a specific time, waits for a bound and hooded target to appear and then blasts them away and collects silver. In his spare time he drives around the barren streets from sleazy club to sleazy club, dropping liquid narcotics into his eyeballs. The most important plot point involves Joe’s older, less criminal self (Bruce Willis) being sent back in time for him to kill, thus closing his loop. Things get complicated (how else would we have a movie if they didn’t?) and Old Joe arrives unhooded and unbound and escapes. Johnson has the filmmaking chops to make an entertaining cat-and-mouse chase movie out of this concept, but Looper evolves into more than that. Besides their initial meeting and an intense conversation at an old school diner, the two Joes barely meet during the course of the movie. Old Joe is there to hunt down the mob boss of the future as a child, and Joe waits out much of the movie at one of the potential targets’ country farmhouse with his mother (Emily Blunt). It would be a disservice to the movie to spend any more time talking about the plot, because the success of Looper is based on learning the rules of this universe and then being absorbed in its frantic pace. This is a bitter vision of the future (what other kind is there in movies?) where government is either nonexistent or yields to the whims of corporate thugs. It is also, to a much less successful extent, about a man reevaluating his place in the world based on knowledge from the future. If editing and pacing is one part of the reason why Looper works, then the acting is another. Gordon-Levitt and Blunt have terrific chemistry and surprisingly unannoying accents, while Willis gives the movie much of its emotional core. In addition to his performance in Moonrise Kingdom, this may mark a new leaf for the often thick-skinned actor. Jeff Daniels and Paul Dano also show up in brief, entertaining bits, but the movie mostly belongs to the other three. The violence can at times be a bit excessive, especially when it involves young children, especially because Old Joe’s story is often much less interesting than what’s going on at the farmhouse. Like Johnson’s debut feature Brick, the fully realized world he creates glosses over the narrative holes (like how exactly Gordon-Levitt looks like Bruce Willis in the future) almost to the point of them not mattering. This entry was posted in Reviews by matterspamer. Bookmark the permalink.